Today at Build 2016 in San Francisco we announced exciting new capabilities of Visual Studio Application Insights, making your diagnostics experience more intelligent, providing immediate answers to ad-hoc queries, and integrating with your existing DevOps workflows. Application Insights is a solution designed for developers, providing fast, easy and non-intrusive analytics tools to interactively diagnose problems and answer tough questions. It helps you identify, understand, and resolve problems in your web apps & services, irrespective of the platform. You can diagnose problems right from within your development environment and incorporate it into your existing DevOps workflows with Azure & Visual Studio Team Services integrations. We have just announced the new big data analytics capability of Application Insights. Analytics gives you answers to tough questions about your application, almost instantaneously. With its rich query language, you can use Analytics to explore your application telemetry data. You can start asking creative questions about the performance and behavior of your apps in flexible ways with interactive queries, and continue to refine them until you pin-point the problem. With Analytics, diagnosing across the entire app stack becomes easy as various perspectives get connected and you can ask the right questions to correlate Service Performance with Business Metrics and Customer Experience. 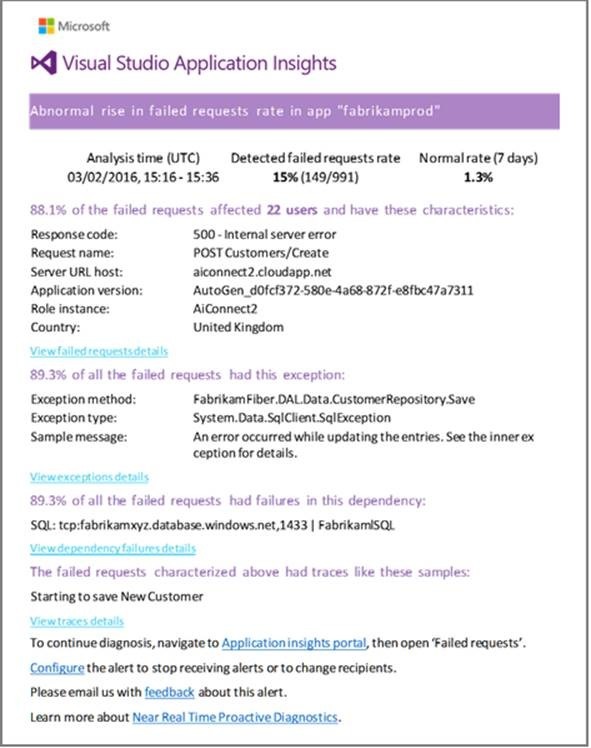 ‘Near Real Time’ Proactive Alerts is a new capability that automatically detects and helps diagnose any abnormal rise in the rate of failed requests in your application. As soon as it detects a rise, it analyzes the failed events to find common attributes such as app version, response codes or geography. Then it finds exceptions, traces and other events related to the failure. It alerts you with all the relevant information so that you can quickly diagnose the problem and fix it. This capability complements Proactive Detection. This formerly-announced feature detects anomalies in your data around application performance and dependencies. It notifies you daily on these anomalies so that you can tune your application’s performance and improve your customer experience. With support for Webhook Callbacks you can now do so much more with Application Insights Alerts, connecting them to 3rd party alert management systems. The new Live Stream Metrics shows you your application metrics right at this very moment, with a near real time latency of 1 second. This is extremely useful when you’re releasing a new build and want to make sure that everything is working as expected or investigating an incident in real time. The new Application Map automatically discovers your application topology, laying the performance information on top of it, to let you easily identify performance bottlenecks and problematic flows across your distributed environment. 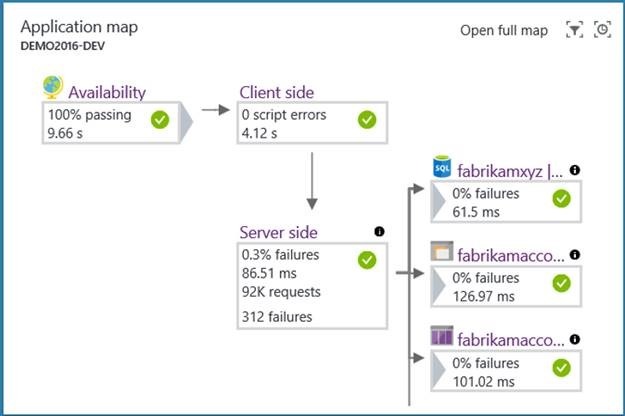 It allows you to discover application dependencies on Azure Services. You can triage the problem by understanding if it is code related or dependency related and from a single place drill into related diagnostics experience. For example, your application may be failing due to performance degradation in SQL tier. With application map you will be able to visually see it and drill into SQL Index Advisor or Query Insights experience. 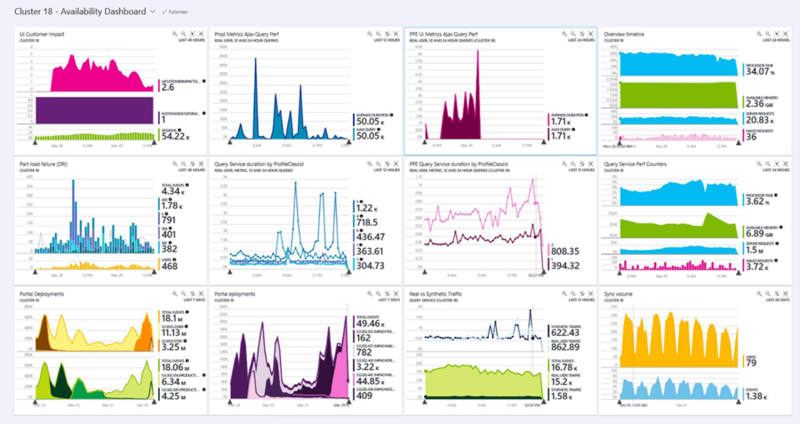 Dashboards allow you to mashup data from multiple Azure resources and applications in a single view. You can bring together charts, metrics and KPIs across all your applications and easily share the operational dashboards with your team members. 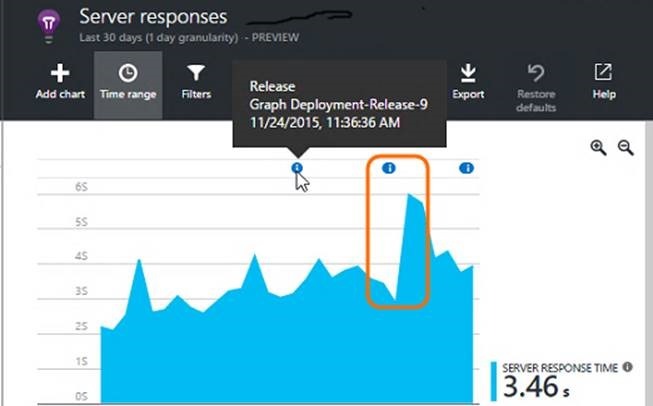 Application Insights is part of Microsoft’s DevOps solution, focused on Service Diagnostics. Integrating with Visual Studio and Visual Studio Team Services makes it easy for you to diagnose problems right from within your development environment and incorporate data driven decisions into your existing DevOps workflows. When you are using Visual Studio as your development environment, you need not go out of your IDE to analyze your telemetry data & diagnose issues in your applications. With Visual Studio 2015 you can search over events from within the IDE and uncover production problems right there. Now with Visual Studio 2015 Update 2, you will also be able to drill down into issues, use the telemetry information as a code navigation aide and jump to code from exception stack traces. Update 2 also brings in automatic logging framework detection with which you can seamless capture your traces and send to Application Insights. 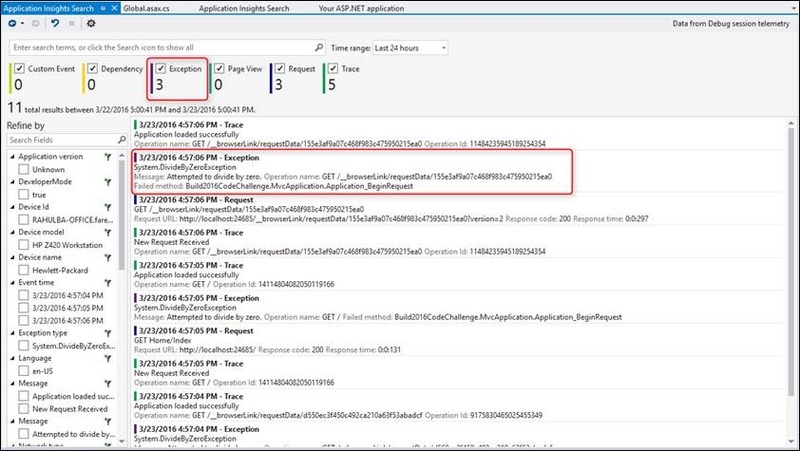 Integration with the Diagnostics Hub also enables a richer debugging experience for you showing Application Insights events alongside other details. 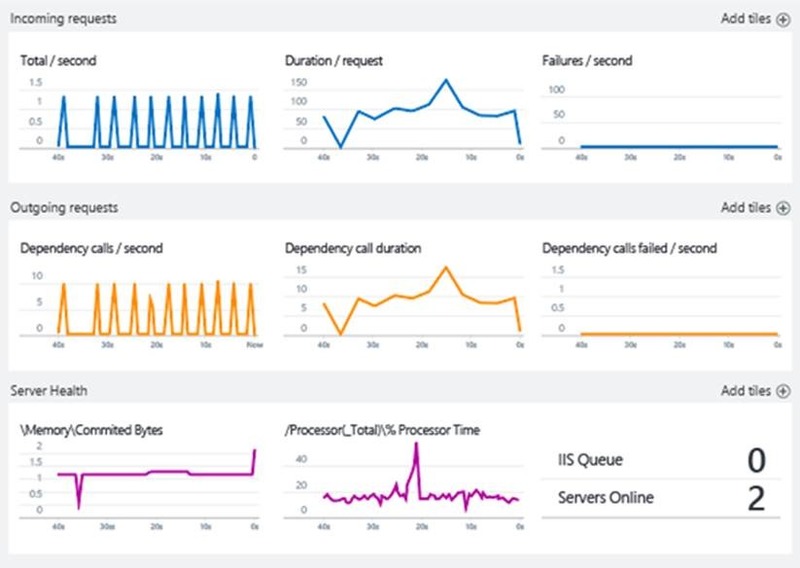 Integrating with Visual Studio Team Services, you can investigate performance changes with synthetic loads using Cloud Load Testing. You can also view release annotations from Release Management in Application Insights and correlate changes in performance with builds. We are also making it easier for you to extend Application Insights to suit your specific requirements. With all our SDKs open-sourced on GitHub you can ingest data from a web application built in any language and running on any platform. We are continuously adding new capabilities to Application Insights and learning from our customers to better address their needs. While we are in Public Preview, we are fully committed to Azure Privacy standards and Security & Compliance policies, so that your data remains safe. And yes, you do get full Customer Support as part of your subscription, so if something is not working right for you, just reach out to us.